I’ve got to tell you about a special guy. He was shorter than me for most of his life, but suddenly, a couple of years ago, I came home to visit and he was looking down at me. He’s got bright blue eyes and a head full of curls, a dry wit, and really fat rabbit he calls Pilfer. I am not brave enough to wear skinny jeans, but he is. He is my little brother, Joel-called-Alex, and that little chubby cheeked guy you see in the photo next to my Caramel Fudge Brownie Cheesecake . 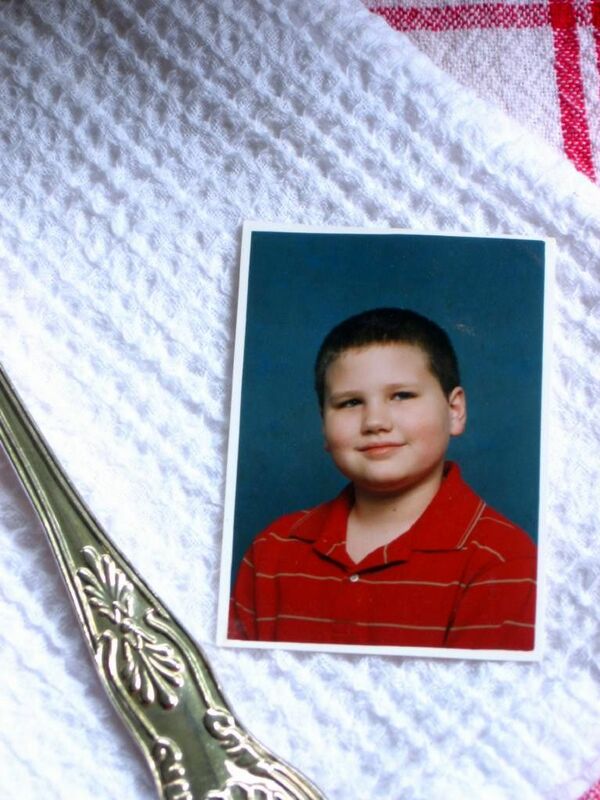 . . that would be him about a decade ago. 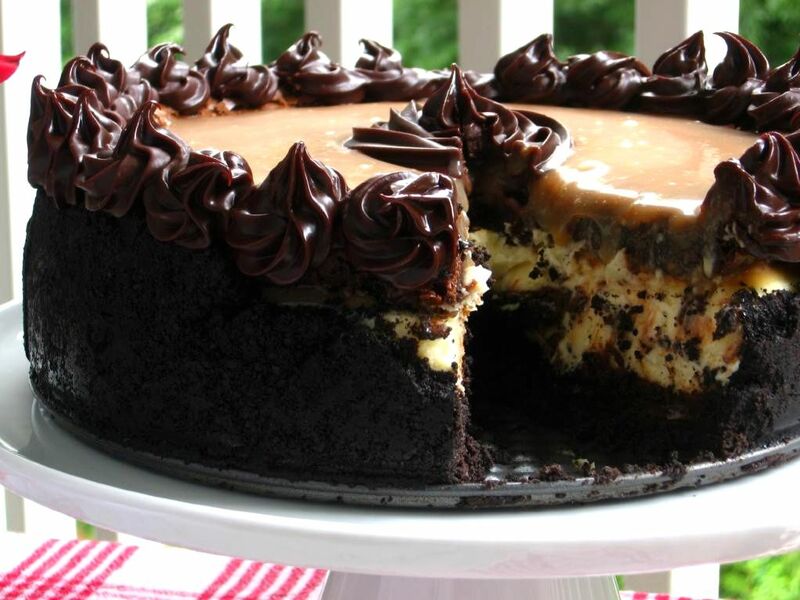 (Speaking of Caramel Fudge Brownie Cheesecake, it may be the best thing I’ve ever eaten — which is probably not surprising considering it’s a Caramel Fudge Brownie Cheesecake). It’s hard to decide which is cuter . . . ganache rosettes or little boy smiles. Look below for a closer view to help you decide. Cakes are nice, but I think he wins! Alex at 8 years old and now! And just like that, little Alex — who I remember driving around in his red PowerWheels jeep and running through sprinklers with me as a kid — was a graduate. In the fall, he’ll begin his undergraduate education at N.C. State, the same school Mike is attending for grad school — now I have two reasons to be a Wolfpack fan! I can already tell you that plenty of school nights will find them playing video games together and acting like goofballs. To fully express my feelings about this momentous occasion, I wrote the following letter and gave it to Alex this week. I thought you might like to read it, too. What is this I hear about you graduating high school? I could have sworn that someone told me you were a senior in high school and were graduating this week. But that’s silly. There must be some mistake. See, you are just a baby. You love your swing, Ernie from Sesame Street, and your older sister, Julie (duh). Soon you will develop a few motor skills and begin arranging your toys: gummy bears and matchbox cars sorted by color (your favorite being “lellow”). You will start using words like “definitely” way before you’re old enough to know four-syllable words. I will be proud to be the sister of such a smart kid. You’re still just a baby! Or maybe you are still 6 years old. You’re a stout, silly little guy with bright blond curls. Just last week I dressed you up in high heels, a green nightie, a poofy hair bow, and took pictures for future blackmail. You love Barney and Friends, and will soon start watching the Power Rangers movie more times than any human being really ought to. Or, okay, maybe you’re a little older than that. Maybe you’re a tween. You are obsessed with Pokemon – movies, drawings, you name it. Yu-Gi-Oh is all right too. In a little while, you’ll be admitted into Hickory Grove Christian School for high school. You’ll start staying up late on the internet, playing lots of video games, and hanging out with friends. You’ll become an amazing writer, an excited reader, and an all-around brilliant guy. You’ll be a 9th grader. Suddenly a 10th grader. Maybe even an 11th grader. Maybe you’ll even go to your senior prom. But graduating? You cannot be graduating. Except . . . you are. In just two days time, you’ll walk across the stage and get your high school diploma. I never thought this day would come (and no, not because I thought you’d flunk out of high school). Nevertheless, since this day is undeniably upon us, there are a couple of things I want to say. First off, I’m so proud of what a smart kid you are; I hope you’ll continue being an amazing writer and reader. Second, and more importantly, you’re a compassionate kid. Third, you have an amazing personality and amazing character. I expect you to do incredible things at N.C. State next year (GO WOLFPACK!) and beyond. Fourth, and most importantly, I love you and always will. Oh, and fifth, sorry about that poofy hair bow. 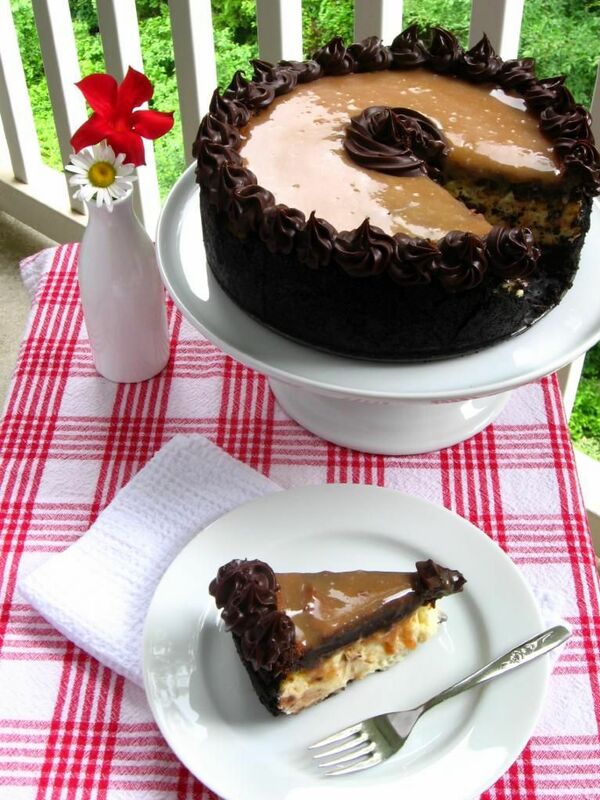 In addition to a boring ol’ letter, Alex will get a nice slab of this Caramel Fudge Brownie Cheesecake on Sunday. 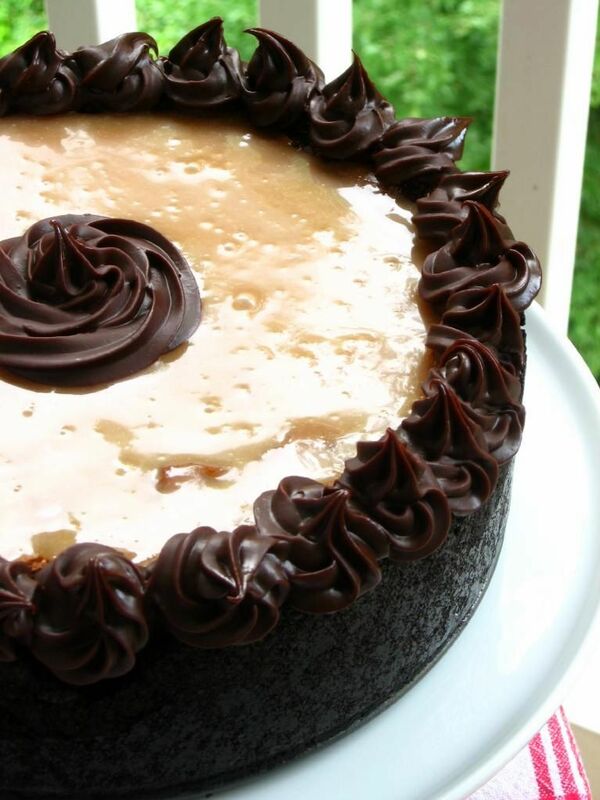 This was inspired by my Coffee Cookie Dough Cheesecake, and I love it just as much! While making this cheesecake certainly does require time and energy, it’s a relatively straightforward recipe and is perfect for a special occasion. 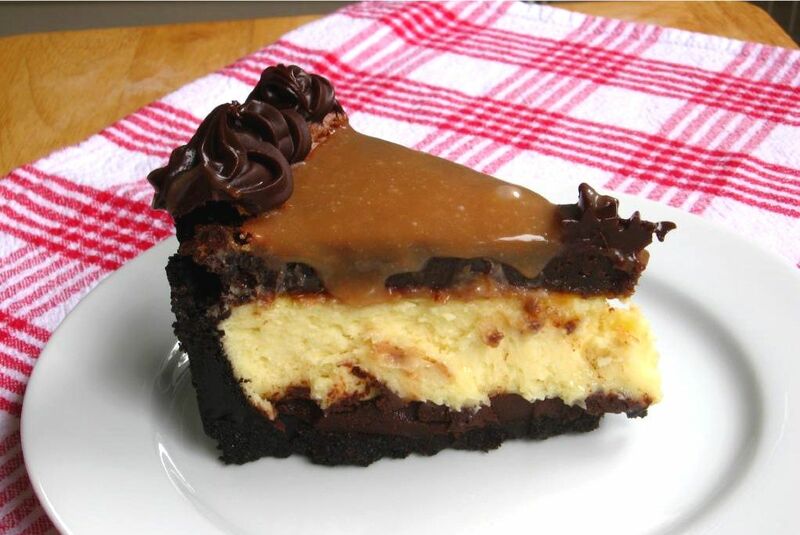 The multistep procedure produces a thick layer of rich brownie drowning in gooey, buttery-tasting caramel sauce, all on top of creamy cheesecake. It also boasts an oreo crust and decadent ganache. I think Alex will approve. Tell me about your graduates! Anyone have a loved one in the Class of 2010? Make the caramel: Prepare an ice-water bath. Heat sugar and water in a medium saucepan over medium-high heat until mixture boils and sugar dissolves, washing down sides of pan often with a wet pastry brush to prevent crystals from forming. Reduce heat to medium, and cook until sugar turns dark amber (about 345 degrees on a candy thermometer), 5 to 7 minutes more. Immediately remove from heat, and carefully whisk in 1/2 cup cream. Return to medium heat, and cook until sugar melts completely and mixture boils. Remove from heat, and pour into a bowl set in ice-water bath. Let caramel cool, stirring often, for 10 minutes. Stir in creme fraiche, vanilla, and salt. Cover and refrigerate at least 2 hours or up to 5 days. Make the brownie layer: Preheat oven to 325°F with rack positioned in the lower third of the oven. Line the bottom and the sides of an 9-inch round cake pan with parchment paper, leaving an overhang on two opposite sides to make it easier to lift the brownies out of the pan when they are done. Combine the butter, cocoa, sugar, coffee granules, and salt in a medium heatproof bowl. Set the bowl in a wide skillet of barely simmering water. Stir the butter cocoa mixture from time to time until the butter is melted and the mixture is smooth and hot enough that you want to remove your finger quickly after dipping it in to test. Remove the bowl from the skillet and set aside briefly until the mixture is only warm, not hot. Using a wooden spoon, stir in the vanilla extract. Add the eggs one at a time, stirring quickly after each one. When the batter looks shiny, thick, and well mixed, add the flour and stir until you cannot see it any longer, then beat for 40 strokes with the wooden spoon. Spread the batter evenly in the lined pan (I used most of the batter, but poured a bit in a separate dish to bake, since I wanted to make my brownie layer a certain thickness – just use your judgment). Bake until a tester inserted into the center comes out just slightly moist with batter, about 25 minutes. Let the brownies cool completely on a rack and then freeze. When ready to use, lift up the ends of the foil or parchment paper liner, and peel foil away. Make the cheesecake: To make the crust, preheat the oven to 350˚ F. Position a rack in the middle of the oven. Butter a 9-inch springform pan and place it on a baking sheet. Combine the chocolate cookie crumbs, melted butter and salt in a small bowl. Toss with a fork to moisten all of the crumbs. Press into a thin layer covering the bottom and sides of the springform pan (at least 3 inches up the sides). Bring the cream to a simmer in a medium saucepan. Place the chocolate in a medium bowl. Once the cream reaches a simmer, pour the cream over the chocolate and let stand 1-2 minutes. Whisk in small circles until a smooth ganache has formed. Pour 1 – 1.5 cups of the ganache over the bottom of the crust. Freeze until the ganache layer is firm, about 30 minutes. Reserve the remaining ganache; cover and let stand at room temperature for later decorating. In the bowl of an electric mixer fitted with the paddle attachment, beat the cream cheese and sugar on medium-high speed until well blended. Beat in the flour. Add in the vanilla and beat until well incorporated, scraping down the sides of the bowl as needed. Beat in the eggs one at a time, scraping down the bowl between each addition. Pour the filling over the cold ganache in the crust. Place the springform pan on a rimmed baking sheet. Bake until the top is lightly browned, puffed and cracked at the edges, and the center moves only very slightly when the pan is lightly shaken, about 1 hour. Transfer to a wire cooling rack. Cool at room temperature for at least 30 minutes. Transfer to the refrigerator and let cool at least 3 hours, until completely chilled and set. Assemble the cheesecake: Wrap a warm towel around the outside of the springform pan to help loosen the crust from the sides. Carefully remove the springform. Transfer the cake to a serving platter. 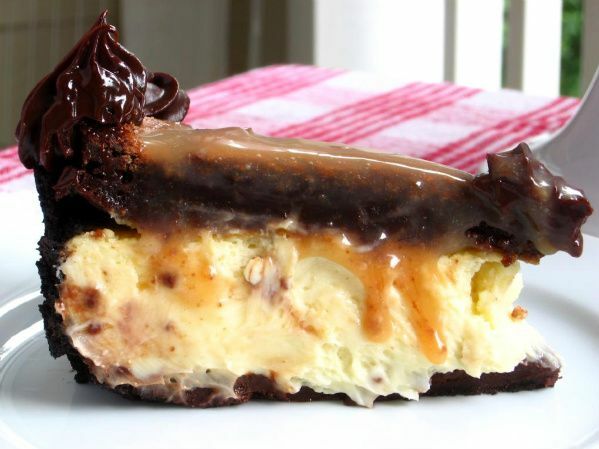 Spread a thin layer of caramel over cheesecake to adhere the brownie layer. Place brownie layer on top of cheesecake (right side up). My brownie layer was almost cup-shaped since the middle didn’t rise as much as the sides, so I poured the rest of my caramel into the concave area and spread it gently (to avoid disturbing the delicate top of the brownies). Place the reserved ganache in a pastry bag fitted with a decorative tip and use to garnish the top of the cake as desired. Chill until the ganache is completely firm, at least 6 hours. *NOTE: This recipe makes extra ganache. I usually just make it and save the rest for truffles, but feel free to make about 3/4 of this recipe if you’d rather not have leftovers. P.S. — Sorry for picking your flowers, Mom, but aren’t they pretty? P.S. 2 — A serving suggestion for those that want to make this dessert extra-ridiculous: instead of serving with regular whipped cream, whip up some caramel cream. ha ha! Your sister rocks! This reminds me of my little brother and I can hardly believe he’s going to be a sophomore next year. wow, how time flies! 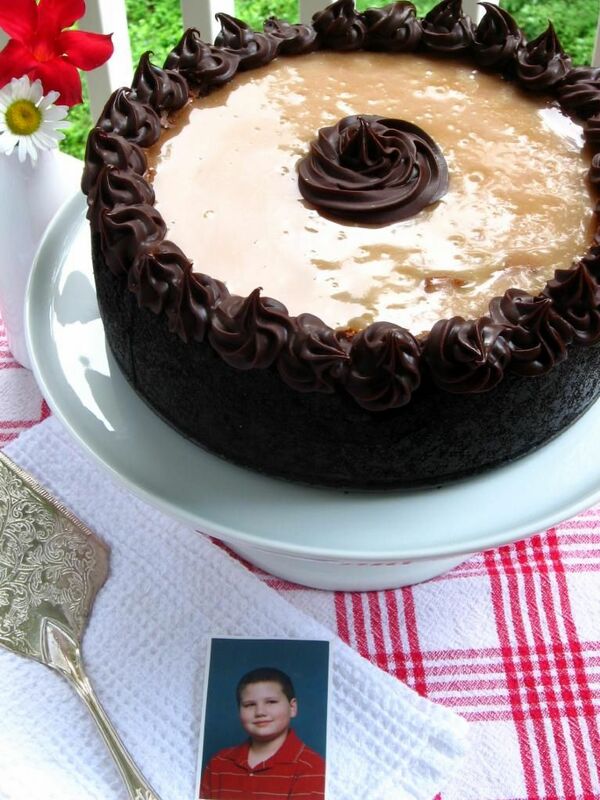 This cheesecake is perfect for your brother and his graduation- congrats! I can see what a proud sister you are and that’s amazing. Congratulations little brother. It looks like you celebrated in style! That cheesecake looks beyond delicious! Congratulations, Alex! What a lovely letter you wrote, Julie! I’m sure he’ll be touched by your heartfelt expression of pride and love. And that cheesecake! Man, oh man! Another decadent, mouthwatering treat. Thanks, Julie! Great article; terrible video! I think my Southern accent has officially fully recuperated from South Korea… oh, boy! Oops I hit submit before I spell checked! What a lucky brother you have! This is a beautiful cake! Thanks for the run down, I hope to make one myself. It IS a strange feeling! Can’t believe he’s an adult, much less off to college and the big wide world! Oh my goodness! You found me the cake I need to make for my husband’s birthday! 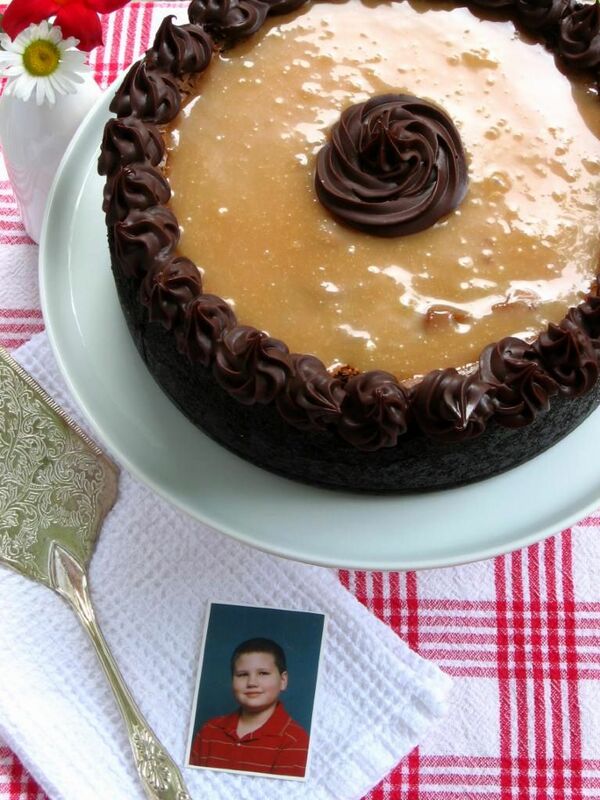 He’s a chocolate caramel fiend….actually, to make him truly happy, I’ll have to figure out a way to make it “turtle”…. Yay! I’m so glad. Hope he loves it, Jennie! We were wild about it! Alex is a lucky guy. He has a sister that cares and a crazy good cheesecake. My oldest grandson, Niko, just graduated..eeks I’m old! Just found your site and am having fun browsing. I’m sure he’ll be touched by your heartfelt expression of pride and love. And that cheesecake! Man, oh man! Another decadent, mouthwatering treat. thanx for sharing. I’m so glad you all enjoyed it, Cris! Congratulations to your boyfriend! Yay! I love hearing things like this, Jessica!! We loved this recipe too — so glad it was perfect for you 🙂 I can’t wait to see your blog post! im from the uk? what exuivelant is 1 cup in grams? or ounzes? also where you put the ganache, would i be able to put another layer of oreos etc on top before the filling? Hello! I hope this measurement conversion calculator is helpful: http://www.gourmetsleuth.com/cooking-conversions/conversions.aspx It allows you to switch from cups to UK measures. If you put too much more, the cheesecake might be too high for the crust, but you can also just use a little less ganache to compensate. I say go for it 🙂 Hope you love it! also when you say heavy cream is that like double cream? It has to do with the fat content in the cream. Hope this helps!! just researched it and its the equivalent of uk whipping cream! Don’t be nervous!! It’s several steps but they’re all pretty easy. I hope it turns out wonderfully! You’ll have to let me know. also when you make the rust do you bake it before you add the ganache? Nope – do it just like it is here (pour ganache in it and freeze before filling with cheesecake filling). sorry for the millions of questions, and yes i will def let you know! is a 24cmx7cm tin big enough? Yes – I use a 9 x 3 inch springform pan, so that’s about 23 x 7.6 cm? Just about perfect! You’re so welcome! If you can get your hands on a candy thermometer, I really recommend trying homemade caramel sauce — it’s a way different taste and very satisfying 🙂 It’s not hard at all with the thermometer — just takes some watching. awww ok! will search for that, need to make it today! is it just a metal thermometer? i dont think i will be able to get hold of one today?! It’s okay if you can’t! Usually you can find them in a grocery store (in the aisle where they have a few pans/utensils) — they’re called candy or deep fry thermometers, and they’re typically big and have a clip to hold them on the side of the pan. You clip them to the pan with the tip in your mixture as it cooks to cook to a specific temperature. Very easy to use! great will go check now, also would it be too crazy to put a cooked brownie layer after the ganache before adding the filling, to cook? I don’t think it would work out well! I’d do it like it’s done here — put the cooked (and briefly frozen) brownie layer on the top after the cheesecake has been cooked. ok will stay clear! got my ingredients! and i was thinking of putting corn syrup (just a little) into the caramel as it stops it from crystallizing is this ok? I’ve heard of that — but it might change the times/etc. The recipe includes directions for washing down the sides with a wet pastry brush (I keep it in a cup of water beside the stove and wash down constantly) and as long as you don’t stir (but only swirl once the amber coloration starts) you shouldn’t have any crystallization! I wish I knew more about the corn syrup process to guide you, but I only know this way — I’ve found it to be really simple, though! Let me know how it goes! will do! thanks allot one last question (promise lol- im making it tomight) do you take the cream out of the cookies to make the base or not? No worries! Ask all you need! Nope, you don’t take the cream out — just process them altogether. im soooo anxious to see what everyone thinks- will show you a pic after the grand reveal!! p.s i wish i had made more gaanche though there is still a tiny gap from the crust and brownie!!! it went down ammmazingly!!! everyone loved it!!! they would not stop asking about what was in it, saying it was the best thing they had tasted!! i only changed the brownie recipe and used nigella lawson brownie recipe, even the caramel turned out great!! how do i send you a pic? Hurray!!!! You are a cheesecake master!! I’m so glad that everyone loved it, and I can’t wait to see! You can send a picture to juruble ‘at’ gmail ‘dot’ com. Can I post it in the reader’s photos section of the “About” page? oooh did i metion i added white choc to the filling!?! it was not too sweet at all, just very rich and morish! Yum, what a great idea!! oh gosh! my sister and i are in the midst of making this cake. we’re not bakers by any means so its a little hard for us but we’re hoping it turns out well! gah we used table cream instead of whipping. will this be ok? Hi Nero! So glad you’re making the cake! 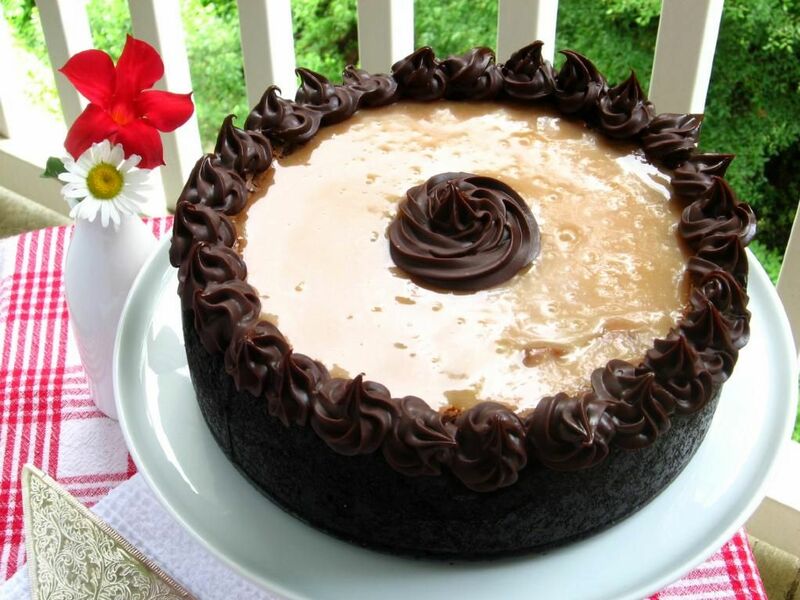 It’s seriously one of my favorite cheesecakes ever! Congrats on your brother graduation…. This cheescake I will be making really soon. One quick question, did you put the crust in the oven before putting the ganache or not? Thanks Annabelle! Nope, I don’t bake the crust before the ganache goes in. Hope you love it! Hi, I’m making this cheesecake and I had a question about the crust. Is is supposed to be baked in the pan before putting the ganache in and freezing it? And if so, for how long? Hi Janna! Nope, I do it just like in the recipe — no baking before you put the ganache in. Happy eating! Cream cheese is almost $5 a brick in Ontario. Can you believe that? Food is so very expensive in Canada. ): This looks great but very expensive to make here! Saving this for a very special occasion! Hi Ruth! It is very possible to scorch — it goes from right to burnt very quickly! I’d say it’s worth mixing up another batch if you have the time! Maybe stop a smidge early since it went too long this time even with the thermometer. I hope you love this cheesecake — I promise it’s worth a little extra trouble 🙂 Let me know!! Thanks. Tried it again– this time I basically had all sugar crystals in my pan befor it got to the right temp– wasn’t liquid anymore so candy therm. temp wasnt going up. I had picked up a jar of caramel topping just in case– alas, that is what I used. It looks great– used the extra ganache to cover the unevenness of my brownie layer- looks nice and sure it tastes wonderful too! ( even with store bought caramel!) 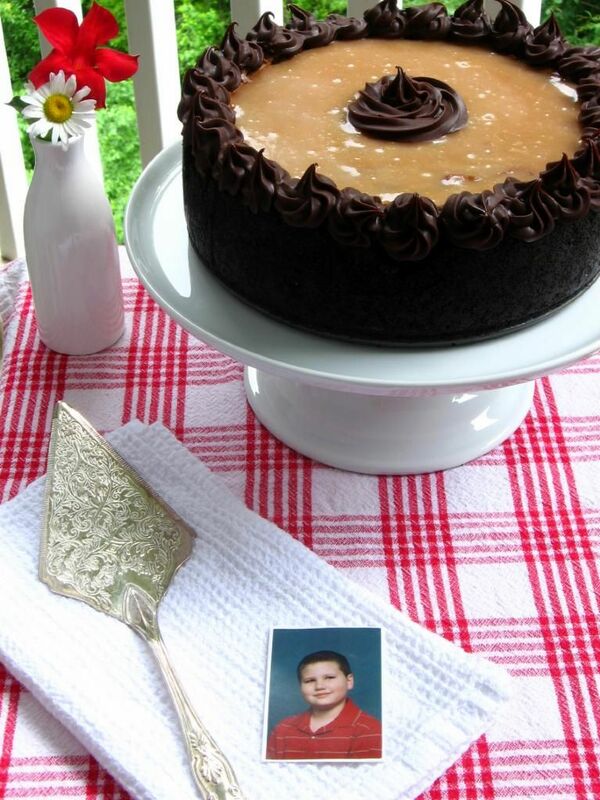 I’ll try the caramel again another day…..
[New Post] Looking for an Easter dessert? I decreed Easter the perfect Lemon Cake holiday, so here are my favorite lemon cake recipes for you! I also threw in some of my other favorite lemon dessert recipes for good measure. Rico, the Prehensile tailed porcupine might be the cutest snacker ever! He loves his sweet potatoes. © Copyright Willow Bird Baking 2019.